One of the ways that can guarantee you always being a step ahead of your competitors and a top player in your niche is to be up-to-date with how your site and your competitors sites are doing from an SEO point of view. New HQ reviews are published about your competitors. Important Competitor Links become broken. A Negative SEO campaign hits you. Some competitors start to outrank you in Google and Bing. These are just some of the things you would like to be kept up-to-date. Not keeping track of this kind of info in an active manner might mean loosing customers, market share and rankings. Unless you want to end up like that, triggered e-mail alerts are an important and yet simple tool that allow you to monitor the most important factors for your SEO campaigns. Being informed first is sometime crucial to your success. E-mail Alerts give you an opportunity to track down any information about your brand/company. If, for instance, a person or competitor plays dirty and decides to start a Negative SEO attack on your site, the alerts give you an opportunity to know the information, when this attack happens, and work on a contingency plan before it is too late and irreversible damage is done to your rankings. It is always important to know what your competitors are up to. This gives you a competitive edge over them … if they are not using the same techniques you are using. What does their new press release say? What is their new product update and how does it affect you? All these are important to find out, when they happen, as they will help you understand quicker and come up with strategies on how to handle the situation. This is a very important advantage. E-mail Alerts saves you the hassle of having to go through hundreds of links and rankings looking for information that is important to you. The system only gives you information that is relevant to you or your company. Google Alerts allows you to track your brand mentions mostly. It is a known fact that Google started to send less and less alerts in the last years as being reported on Forbes. If you want to stay ahead of the curve and get notified when a site gets or loses links or when a sites keyword positions in Google, Bing or Yahoo change, you should use the cognitiveSEO newly released “Alerts” module. Here is a quick overview on what type of Alerts you are able to setup and how they will benefit you. Using this type of alert you will get notified of the new links a site gets. This is really useful for your own site, as you do not have to check your backlinks on a daily basis and see what new links appeared to your site. Since the last time you checked. The new links get delivered to your inbox as soon as they appear. You have several options that you can customize your Link Alerts such as: New Links from Specific Domains, New Links that are marked as Unnatural and more. Monitor your own site for new links. Monitor your competitors for new links. Monitor Negative SEO attacks on any site. Get notified by e-mail almost instantly. 2. Get instantly notified when Links become broken. A link may become broken for several reasons. The most common result of a dead link is a 404 error, which indicates that the web server responded, but the specific page could not be found. A link may also become broken due to the linking sites’ re-organization or due to a specific link deletion. Getting notified when you lose links is important for your SEO process as it allows you to act immediately and eventually get the lost link back, if it is an important link. Having lost link triggers setup on your competitors will help you instantly use the broken link building technique. Monitor your own site for lost links. Monitor your competitors for lost links. Use the Broken Link Building Technique on a daily basis on new broken links. 3. Get instantly notified when a keyword rank changes in Google. Rank tracking interfaces are great, but you aren’t going to check a rank tracker on a daily basis and see what has changed since yesterday. With the rank tracking alerts you will be able to instantly get notified by e-mail when a keyword rank drops or increases. For example, if you are operating a site in the furniture niche and a very important keyword for you is “new york furniture” you could setup an alert on this keyword and instruct it to notify you when your site or your competitors’ are dropping or increasing with more than 5 positions. This way you will get notified when it really makes sense for you. Monitor your own site for keyword drops or increases. Monitor your competitors for keyword drops or increases. Monitor Google, Yahoo and Bing. Your clients may also receive direct e-mails like these. Get notified by e-mail almost instantly, weekly or monthly. You decide if it’s important to keep yourself updated on your site and your competitors. It only takes a few minutes to setup the alerts and you are ready to go! This is a great update! I am excited to keep testing this out! Keep up the great work! tks for the appreciation ;). it is really useful! Fantastic use of Google Alerts to monitor the brand and reputation of the site !! Gonna set up the email alert recommended over your shoulder !! We are a digital marketing company in India and we surely try out your trail. Hope to see stable performance. For getting success in any field, it is very necessary to monitor the strategies of your competitors. 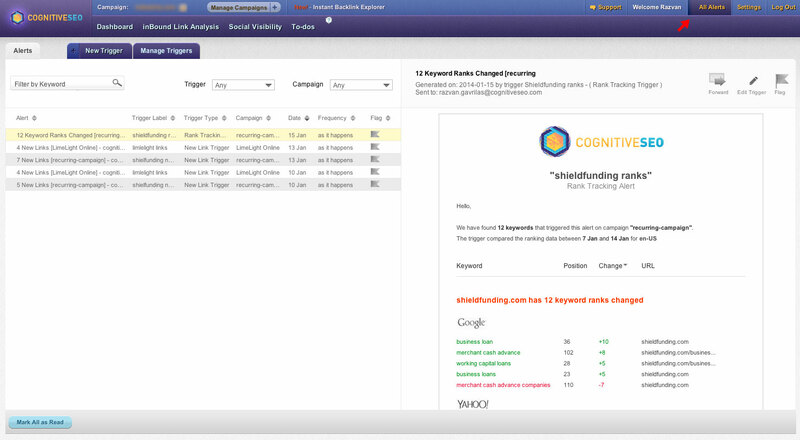 I am very happy to read about the Cognitive SEO tool which make it easy to send email alerts. It sounds like pretty awesome to read this great tool and looking forwards for more features of this tool. Google suddenly stopped indexing my sites and showing results in search engine. What could be the possible reason and can this tool help me any way? lots of reasons. too complex to say it just from that. ccheck your GWT firt of all 😉 then invesitgate deeper for unntural links or on page issues. I think that will be very helpful for us. but if we create some unnatural links by blog commenting then how we delete them. you should disavow them if you can not get the site to remove them.